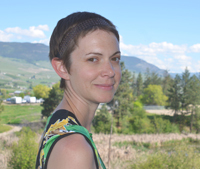 Ashley Little received a BFA in Creative Writing and Film Studies from The University of Victoria. Her first novel, PRICK: Confessions of a Tattoo Artist (Tightrope Books, 2011) was shortlisted for a ReLit award and optioned for film. The New Normal (Orca, 2013) won the Sheila A. Egoff Children’s Literature Award. Ashley’s third novel, Anatomy of a Girl Gang (Arsenal Pulp Press, 2013), won the Ethel Wilson Fiction Prize and has been optioned for television.